Dental implants are artificial tooth roots. They represent a huge advancement in dental technology and have benefitted the lives of millions. In the past, when a tooth was lost, it could not be replaced. Missing teeth cause much larger aesthetic and health problems than just an imperfect smile. When a dental implant is placed, it actually fuses with the surrounding tissue and acts as a permanent, strong tooth root replacement. Consultation | You will meet with our doctor to consider your options. If dental implants are indeed the best option for you, a date will be scheduled to begin treatment. Dental Implant Placement | Once you are completely comfortable and ready, we will gently place the dental implant in the ideal location. We utilize top technology to make sure this process will be comfortable, safe, and accurate. Healing | The implant undergoes a process called “osseointegration” in which the implant fuses with the supportive tissue. This usually takes 3-6 months or less. Restoration | Your new, beautiful dental crowns, bridges or dentures will be affixed to the dental implant. Live! | With your new dental implant healed and restored, you are free to live your life to the fullest without worrying about missing teeth or dental apparatuses. Permanent | A dental implant is intended to be a permanent tooth root replacement. Durable | Your dental implant is designed to last for the rest of your life. 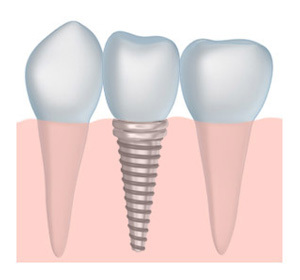 When healed and fused, a dental implant is strong and resilient—just like your natural teeth. Fountain of Youth | Missing teeth can lead to bone loss in the jaw. Dental implants can actually help prevent this and keep you looking vibrant! Visit us or call and schedule a visit to learn more about dental implants to see if they are right for you.